July 20 is the International Chess Day. The World Chess Federation FIDE was established 94 years ago, in 1924 on July 20. To celebrate this day, the Georgian Chess Federation and the Organizing Committee of the 43rd Chess Olympiad held an event at Vera park, Tbilisi. And the cooperation with tea “Gurieli” was announced today – one of the distinguished Georgian brands has become the Chess Olympiad’s sponsor! The contract was signed by the Georgian Chess Federation president Giorgi Giorgadze and the director of “Geoplant”, the company producing tea “Gurieli”, Mikheil Chkuaseli. The celebratory event was attended by the legendary chess player, the five-time World Champion Nona Gaprindashvili, the European Chess Union president Zurab Azmaiparashvili and the Head of the Sport Department of the Ministry of Education, Science, Culture and Sport of Georgia – Irakli Dolaberidze. “We congratulate everyone with the International Chess Day! To anyone who can be proud with the achievements in this sport, including Georgians. We have had great champions and very successful chess players! You already know that Georgia is hosting the 2018 World Chess Olympiad. This is a great challenge for our country and I am glad that this large project has one more successful supporter – and I can freely say this about tea “Gurieli”. I want to thank Mr. Mikheil for his support and I hope that Georgian tea can help the Georgian chess team members play successfully”. – Said the Georgian Chess Federation president Giorgi Giorgadze. “I am proud that Mrs. Nona Gaprindashvili is with us today, the person who has made the name for Georgian chess and Georgian sport in general. Our company is proud to support the 43rd Chess Olympiad and cooperate with Georgian chess family. I also want to tell you that we have prepared a special present for every winner of the Chess Olympiad. Each winner will be awarded with a special product created by tea “Gurieli” in connection with the centenary of the Democratic Republic of Georgia. I want to underline the fact that this present contains all the aromas from Georgia, including from Abkhazia and Samachablo. And today, I want to gift the Georgian Chess Federation with our special product”. – Said the director of the company “Geoplant” – Mikheil Chkuaseli. “I want to thank tea “Gurieli” for cooperating and for this wonderful present. Yes, the Olympiad is where we, Georgians have to tell the world one more time that Abkhazia and Samachablo is our country’s ancient parts. Taking this into account, tea “Gurieli’s” present needs to be appreciated 10 times more”. – Said the European Chess Union president Zurab Azmaiparashvili. 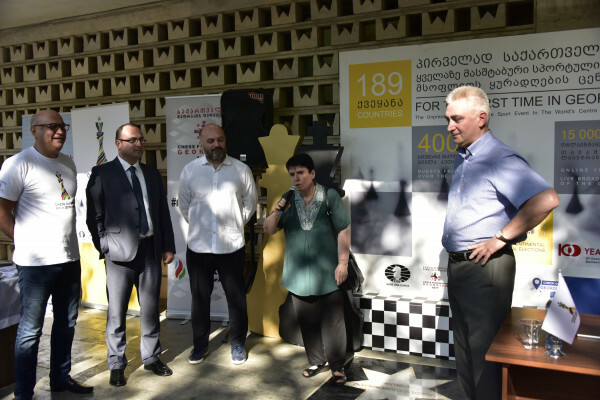 Today, a simultaneous exhibition was held at Vera park, a photo exhibition depicting the greatness of Georgian chess was held and the chess quiz winners were awarded with the 43rd Chess Olympiad themed prizes. Batumi will host the 43rd Chess Olympiad from September 23 to October 5. Georgia will be visited by 4 000 guests from 189 countries specially for the Olympiad.